The Vizsla, or Hungarian Pointer, originated from Hungary. Between World War I and World War II, the Vizsla became almost extinct. The Hungarian people who fled to escape the Russian occupation in 1945 smuggled these beloved dogs out of the country. The Vizsla name means alert and responsive, cherished by the landowning aristocracy for its hunting abilities, its majestic appearance, and warm personality. The Hungarian Pointer is thought to be one of the oldest sporting breeds – a hunter and companion. Color – golden rust. The coat is short and close lying without undercoat. Vizslas are very friendly, affectionate, and loyal dogs. These dogs don’t make good kennel dogs, they need to be active and stretch their legs. Also great house dogs, perfect for your hunters and children. These dogs like to hunt close, will point, and retrieve. Primarily used for hunting pheasant, quail, and grouse. They are quick and eager learners, and they want to please you. Vizsla’s love warmth and can often be found basking in the sun. Vizslas need to be a part of the family and at times will follow you from room to room. For some people this attachment can be overwhelming. We personally greatly enjoy having a dog that wants to be with you and please you. Vizslas have gorgeous, soft, rust-colored coats that require very little up keep. They do shed, but have very little odor. Vizslas are an exceptionally healthy breed often living over 14 years. Vizslas are susceptible to hip dysplasia. X-rays must be taken after the age of 24 months. When purchasing a puppy, make sure that both parents have been OFA certified. 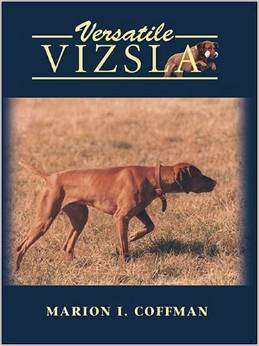 We recommend the following book to all owners of Vizslas. It is an excellent resource.